Please accept my blessings. Over the past ten years I have given the framework and now we have become more than the British Empire. Even the British Empire was not as expansive as we. They had only a portion of the world, and we have not completed expanding. We must expand more and more unlimitedly. 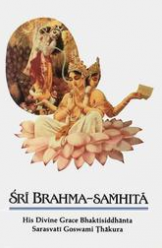 But I must now remind you that I have to complete the translation of the Srimad-Bhagavatam. This is the greatest contribution; our books have given us a respectable position. People have no faith in this church or temple worship. Those days are gone. Of course, we have to maintain the temples as it is necessary to keep our spirits high. Simply intellectualism will not do, there must be practical purification. …Bathing in the Ganges can certainly cure one of many infectious diseases, but it cannot cleanse one’s materially attached mind, which creates all kinds of contaminations in material existence. However, one who directly associates with the Supreme Lord by hearing of His activities cleanses the dirt from his mind and very soon comes to Kṛṣṇa consciousness. For many of us who came of age in the Sixties and Seventies, the counterculture and its promise of an alternative society based on love and peace was an important part of our lives. 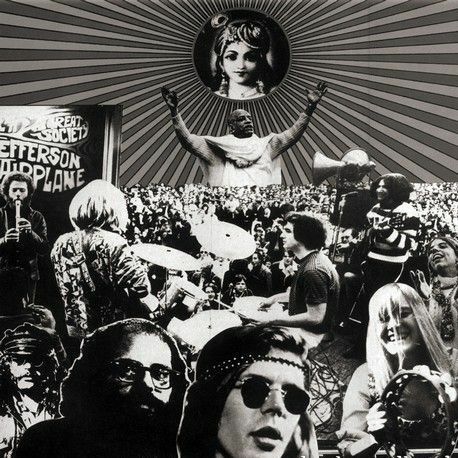 Art, music, poetry, philosophy, ecology and human rights were just a few of the buzzwords floating through the collective psyche of the Sixties generation. Revolution was in the air. “The establishment” was doomed and soon to be replaced with a kinder, gentler society. Peace would reign supreme and all peoples of the world would unite and be free from the chains of oppression. Or so we thought. At the time, it appeared that massive cultural changes were about to sweep away the capitalist system (or the “military industrial complex,” as we used to call it). Every day there was a new victory for change. Underground newspapers proliferated, broadcasting the latest progress reports: the sit-ins, the love-ins, the be-ins, the antiwar and civil rights demonstrations, the Democratic National Convention of 1968, the Chicago Seven Trial, Woodstock, etc. Something was happening here, and it was big. This is the ongoing dispute between ISKCON Bangalore and ISKCON Mumbai with Sri Madhu Pandit Dasa’s official reply to EC, followed by the EC Letter to Madhu Pandit Dasa. Hopefully all this will be settleded up someday, and devotees can go back to serving the mission of Srila Prabhupada and Lord Caitanya, and work together again in the spirit of cooperation. By: Madhu Pandit Dasa, Bangalore. We beg to acknowledge your letter dated 27th Oct 2013 addressed to three of us. I had immediately replied to your above letter on 28th October stating that we will respond to it soon. I noticed several discrepancies vis-a-vis what transpired in the meeting as you have stated. There were many things in the your letter which did not represent accurately and completely what transpired in our discussion in Chennai with HH Jayapataka Swami, HH Bhanu Swami and Dayaram Das. Probably it is due to miscommunication and partial communication from the source where you got the information (from one of the bureau members). It is understandable considering that it is second hand information and those who presented it also probably wanted to dilute it hoping against hope for some serious reforms in ISKCON and was shooting off our shoulders to achieve the same. 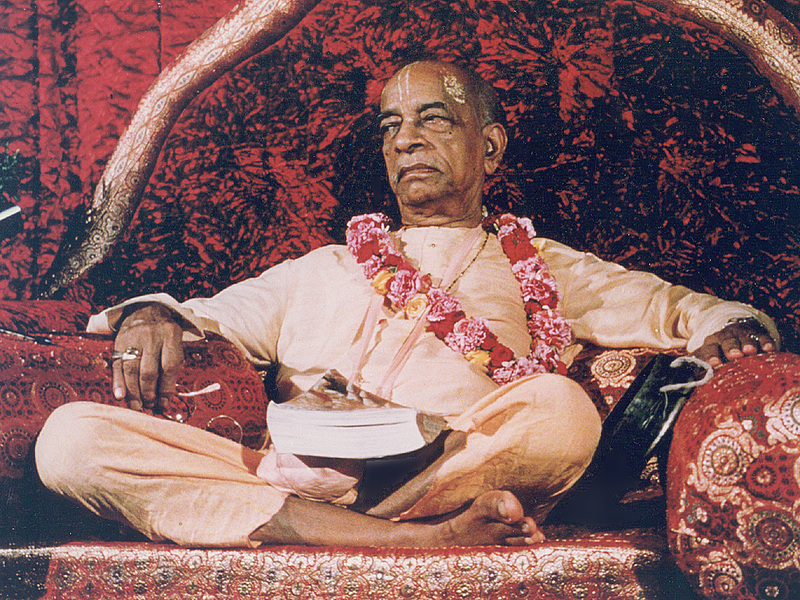 In honor of the auspicious anniversary of Srila Prabhupada’s incorporation of ISKCON New York, in 1966, we post the following Lecture which has some very fundamental explanations of why this movement was founded. …So these centers are being opened just to give the opportunity to the people who are suffering not only in this life, life after life. Dormant devotional service to Kṛṣṇa is within everyone. Simply by associating with devotees, hearing their good instructions and chanting the Hare Kṛṣṇa mantra, dormant love for Kṛṣṇa is awakened. In this way one acquires the seed of devotional service. Guru-kṛṣṇa-prasāde pāya bhakti-latā-bīja (CC Madhya 19.151). So it is our duty, we have taken this duty on behalf of Krsna. Krsna personally comes to teach. Just like He left His Srimad-Bhagavatam. Then He entrusts His devotees to explain to the people in general. We are attempting to do that. We have not manufactured anything or we have got anything of our own. The asset and the property is there. We are simply distributing as peon. That’s all. And we have no difficulty. If we simply present Bhagavad-gita, the instruction of Krsna, as it is, then our duty finished. We haven’t got to manufacture anything; neither we have power to manufacture anything. Just like there are so many others. They manufacture new type of ideas, new type of philosphy…, all nonsense. That will not help. Take the real knowledge. …We should hear from Kṛṣṇa and distribute this knowledge. We have no difficulty. Then those who will hear, they will be benefited and we will be benefited. This is Kṛṣṇa consciousness movement. The Hare Krishna Movement is a worldwide community of devotees practicing bhakti-yoga, the eternal science of loving service to God. 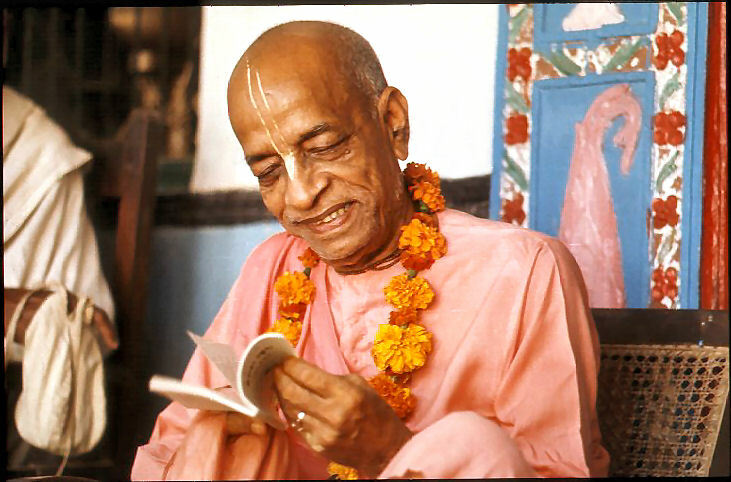 The movement was founded in the western world in 1966 by His Divine Grace A.C. Bhaktivedanta Swami Prabhupada, a pure devotee of God representing an unbroken chain of spiritual masters originating with Lord Krsna Himself. Although the Movement has changed in many ways since the physical departure of Srila Prabhupada, still the principles, and practice has remained the same. And Srila Prabhupada is still the Spiritual Master for the Hare Krishna Movement. Continuing with our series of a True account entitled Perfect Questions, Perfect Answers… A search for meaning carries Bob Cohen, a young American Peace Corps worker halfway around the world, to an ancient village in the midst of West Bengal. There, in a small bamboo hut, he finds a teacher who is able to tell him everything he ever wanted to know. Śrīla Prabhupāda: This movement is especially meant to enable a human being to reach the real goal of life. Bob: The real goal… ? Śrīla Prabhupāda: The real goal of life. Bob: Is the real goal of life to know God? Śrīla Prabhupāda: Yes. To go back home, back to Godhead. That is the real goal of life. The water that comes from the sea forms clouds, the clouds fall down as rain, and the actual goal is to flow down the river and again enter the sea. So, we have come from God, and now we are embarrassed by material life. Therefore, our aim should be to get out of this embarrassing situation and go back home, back to Godhead. This is the real goal of life. 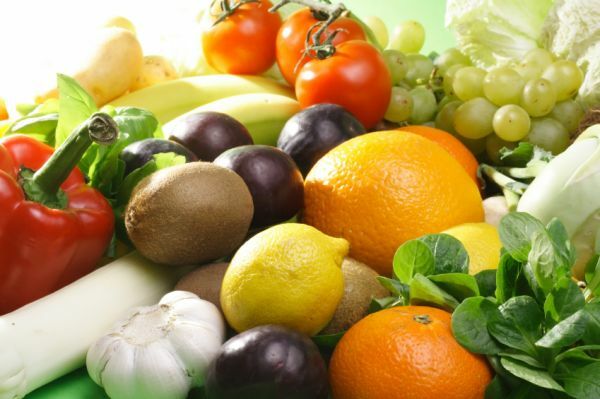 “Can a vegetarian diet improve or restore health? Can it prevent certain diseases? Advocates of vegetarianism have said yes for many years, although they didn’t have much support from modern science until recently. Now, medical researchers have discovered evidence of a link between meat-eating and such killers as heart disease and cancer, so they’re giving vegetarianism another look. Since the 1960s, scientists have suspected that a meat-based diet is somehow related to the development of arteriosclerosis and heart disease. As early as 1961, the Journal of the American Medical Association said: “Ninety to ninety-seven percent of heart disease can be prevented by a vegetarian diet.” Since that time, several well-organized studies have scientifically shown that after tobacco and alcohol, the consumption of meat is the greatest single cause of mortality in Western Europe, the United States, Australia, and other affluent areas of the world. Ladies and gentlemen, we are very much thankful to you for your kindly participating in this great movement, Hare Krishna. This Hare Krishna Movement is especially meant for this age because for self-realization, although there are many methods recommended in Vedic scriptures, in this age the greatest common factor for self-realization is simply chanting this Hare Krishna mantra. Actually, our miserable condition of life is due to our forgetfulness. As I said yesterday, day before yesterday, this material existence is a condemned position of the living entities, exactly like a criminal is placed in the prisonhouse. Now, the whole Vedic literature is meant for getting us liberated from this condition of life. So far Bhagavad-gita is concerned, the same aim is there because at the ultimate instruction, Lord Krishna says, sarva-dharman parityajya mam ekam saranam vraja [Bg. 18.66]. Kirtananda Swami, former American Hare Krishna leader, died Monday in a hospital near Mumbai, India. According to his brother, Gerald Ham, he died of kidney failure at age 74. Kirtananda Swami, was born September 6, 1937 New York. 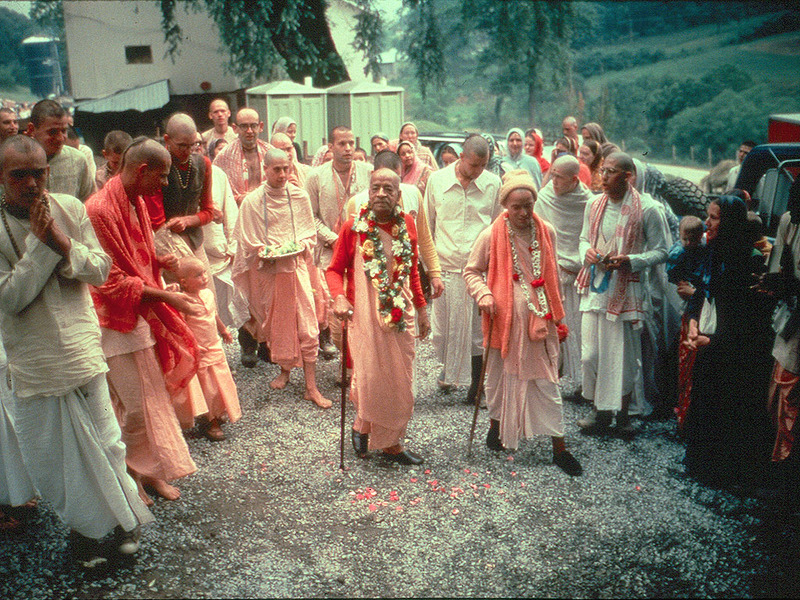 Given the name Keith Gordon Ham, he was the youngest child of a Baptist minister, Kirtananda was among the first Hare Krishna devotees in the United States. 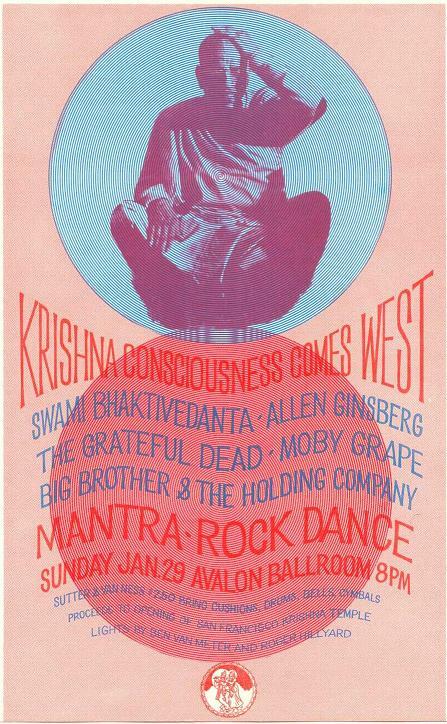 In 1968 he founded what eventually became the largest Hare Krishna community in the country. Despite having been excommunicated in 1987 by the leadership of the Hare Krishna movement, he presided over that community until 1994. Regarding Kirtanananda’s letter, I may inform you that I always think of him and pray to Krishna for his good sense. That is my duty. Anyone who comes to me for my help or wants advance in Krishna Consciousness, and whom I initiate and accept as my disciple, I must pray for him and his welfare always. So Kirtanananda personally served me, especially during my illness, which I always remember. But because somehow or other he has misunderstood our activities that does not mean that I am no longer his well wisher. I write at the end of my letters to my disciples, “Your ever well-wisher”, and as such, I cannot become otherwise than being ever well-wisher of my disciples, even though he may leave me. So I was praying to Krishna that He may save Kirtanananda from his misunderstanding and if ever he chanted Hare Krishna at least once in sincere heart, I am sure Krishna would not allow him to go out of his influence. Therefore, I believe that he can never forget the Form of Krishna, neither he can deny His Personality. It is good news that he is trying to establish a new Vrindaban, which I suggested through Hayagriva Brahmacari, and if he is successful, in his attempt, certainly it will be considered a great benediction upon him by Lord Krishna. When I offered him Sannyas, I expected such great achievements through him and if Krishna desires, he will come out successful in his great attempt. Yes, I expressed my desire to go there through Hayagriva Brahmacari, and if I am invited, to go there, by Kirtanananda Swami, it will be my great pleasure to see the place and enjoy his company. Recent history has demonstrated Srila Prabhupada to be by far the greatest exponent of Lord Caitanya’s teachings, who freed them, carried them from the Indian sub-continent to the rest of the world. It is said that Nityananda Prabhu plundered the storehouse of love of God when preaching in Bengal by the order of Caitanya Mahaprabhu. 477 years later Srila Prabhupada again plundered that storehouse, only to return with the treasure to India to distribute it once again! These feats are impossible to duplicate. They have already changed the course of history. Even though Bhagavad-gita and Srimad Bhagavatam were spoken and recorded in 3,000 B.C., it wasn’t until 1965 A.D., 5,000 years later, that these original sastras containing the Yuga Dharma were released from India by His Divine Grace A.C. Bhaktivedanta Swami Prabhupada. Bhaktivinode Thakur had previously inaugurated the Hare Krsna Movement, the emblem of that Yuga Dharma, when he sent his Caitanya—His Life and Precepts to McGill University, Canada, in 1896. More copies of this sublime volume have been found in other countries, suggesting that the Thakur made an extensive mailing to the major English-speaking universities of his day. Our Hare Krishna movement is standing on three principal things: chanting, dancing, and eating prasadam. 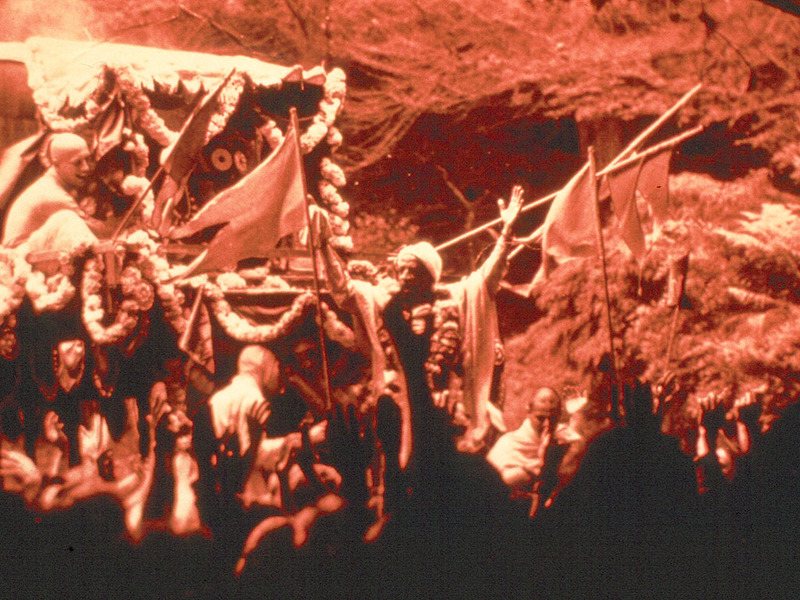 Srila Prabhupada: Melbourne, Tokyo, and many other places. And India also, in Calcutta also. So this festival, taking part in these festivals means a step forward for our self-realization. Rathe ca vamanamarstva punar janma na vidyate. Simply by seeing the Lord on the chariot, one makes advancement for stopping the repetition of birth and death. Simply by understanding Krishna, Krishna’s appearance, Krishna’s disappearance, Krishna’s activities. This Rathayatra is one of the activities of Krishna. Therefore to take part in the Rathayatra festival means to associate with Krishna directly. So in this way, if we associate with Krishna’s name, Krishna’s pastimes, Krishna’s qualities, Krishna’s form, then, gradually, we transcend this material existence Janma karma me divyam yo janati tattvatah. If we simply try to understand about Krishna’s movement, then the result is, Krishna says, tyaktva deham: we have to give up this body. But if we give up this body after being elevated into Krishna consciousness, then Krishna says, tyaktva deham punar janma naiti [Bg. 4.9]. Then, after giving up this body, you haven’t got to accept another material body. Tyaktva deham punar janma naiti [Bg. 4.9]. Then where shall I go? Krishna says, mam eti: “He comes to Me. Madhu Pandit Dasa (former name Madhusudan S) was born in 1956 in Trivandrum, India. As a pre-degree student, he was selected by the National Science Talent search program of the country. He completed his B.Tech in Civil Engineering from IIT-Mumbai in the year 1980. 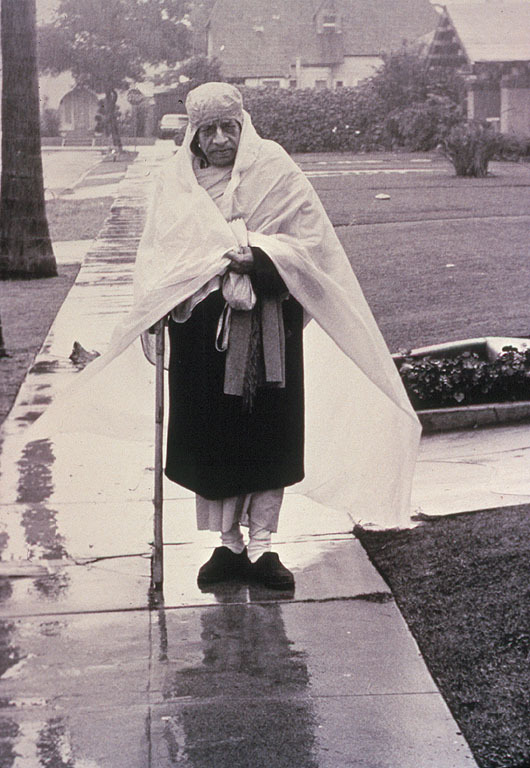 During his days in IIT, he became interested in the books of Srila Prabhupada, the founder-acharya of ISKCON. While he was doing his M.Tech course in IIT-Mumbai in 1981, he dedicated himself to the service of humanity by becoming a full-time member of ISKCON. He began to travel all over South India organizing programs to increase the awareness of ISKCON and its mission. 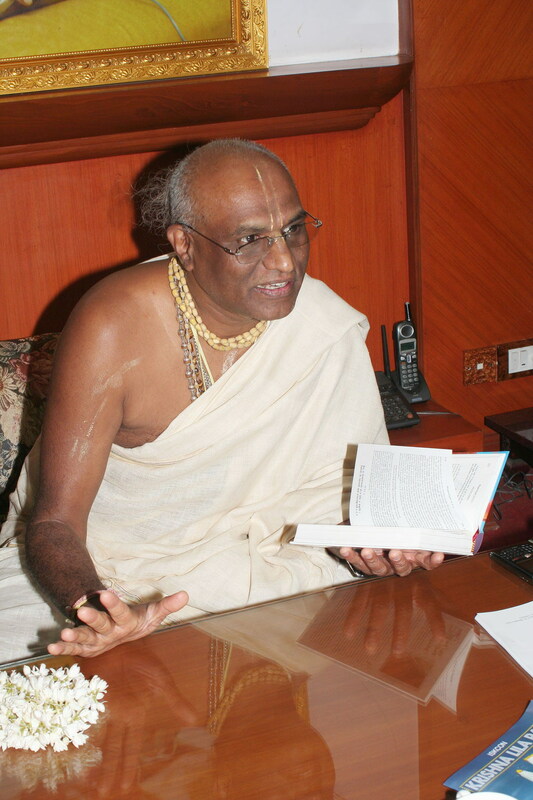 Seeing his potential as a leader, he was soon made the President of ISKCON, Trivandrum. In 1983, he became involved in overseeing the activities of ISKCON, Bangalore along with his responsibilities in Trivandrum temple. At that time a small fledgling centre in a rented apartment in an inconspicuous neighborhood of the city. 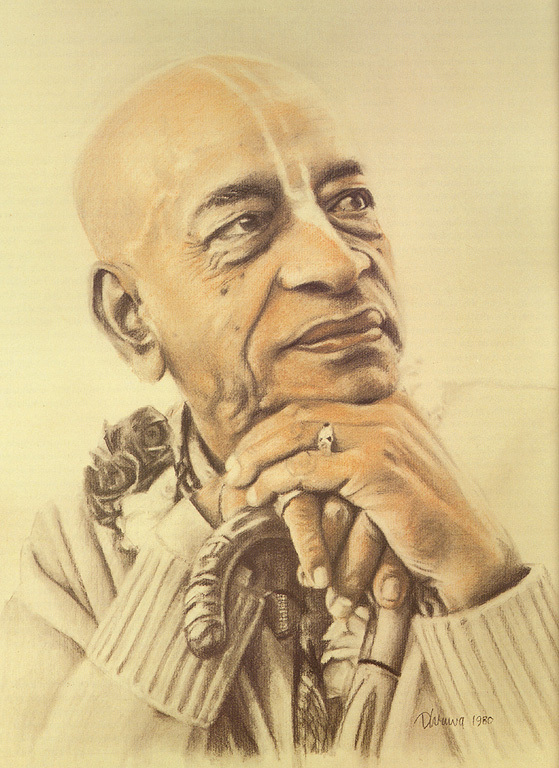 Under his leadership, soon the popularity and activities of ISKCON-Bangalore began to blossom. In 1988, the Government of Karnataka allotted 6.5 acres of a rocky abandoned hillock in the city to set up a cultural complex. Being dissatisfied with what the commissioned architects were proposing for the cultural complex, he took upon himself to design the complex according to what he had envisioned. Soon he also started organizing efforts to raise funds for the construction of the complex. The next ten years unfolded an unprecedented scale of development on the hillock, now called the Hare Krishna Hill: the design and construction of a colossal cultural complex, mobilization of support and fund raising to a tune of Rs. 38 crores (Rs.380 million or $ 9.5 million) and recruiting and training nearly 100 full-time dedicated members of ISKCON. The monumental Cultural Complex was inaugurated in 1997 by the then President of India Dr. Shankar Dayal Sharma. In 1994, he initiated an integrated social development project for the benefit of the rural people of Mysore and Mandya districts. A model, prototype organic farm based on natural and earth-friendly farming methods along with an internationally accredited farmer-training center has been setup in the 110-acre land on the banks of river Kaveri in Srirangapatam. The primary purpose of this is to establish self-sufficient farming communities. The farming techniques employed are traditional and organic to promote pro-environmental agriculture. Hundreds of farmers are deriving inspiration to adopt environmental and soil friendly agricultural methods researched and disseminated scientifically from this model farm. Rural women are trained in this farm in the practices and methods of organic farming. This farm is also supporting hundreds of farmers during the transition from chemical to organic farms. Many neighboring farms have successfully converted into organic farms. He initiated the Akshaya Patra program to provide mid-day meals to underprivileged children in the Government schools of Bangalore Rural District during July 2000. Recently there was a nice article on the Sampradaya Sun posted by Sriman Dhira Govinda Prabhu on the Current and Direct Link, for continuance of the disciplic succession in ISKCON, and two nice spin off articles. Enclosed are two of the recent articles submitted by readers. “most recent, commonly known, practiced or accepted, widespread, circulating and valid at present”. Which all seems to fit very easily into the idea that Srila Prabhupada is the Spiritual Master, the current link that is illustrated here in the purport of SB 2.9.7. The point in approaching a spiritual master or current link in disciplic succession is to take initiation from him. The first draft of The Hare Krishna Explosion was written in July, 1969, just after Srila Prabhupada’s first visit to New Vrindaban. At that time, I realized that the details of the beginnings of the Krishna Consciousness Movement had best be recorded while events were still fresh. Working from notebooks, diaries and memory, I compiled the first draft within a month. Then the manuscript remained packed away, until Srila Prabhupada left this mortal world in November, 1977. 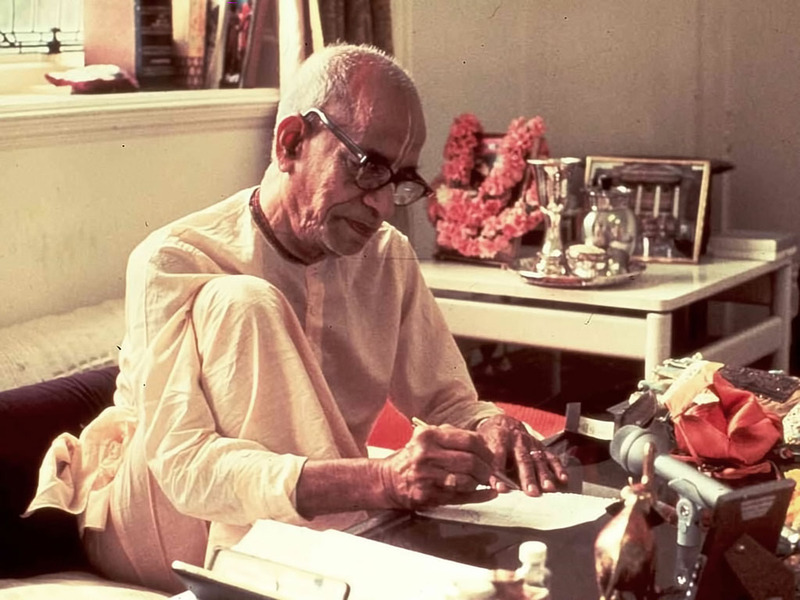 During those interim years, both the manuscript and my mind had accumulated some dust, but convinced of the value of anything dealing with Srila Prabhupada, I began again, and completed the second draft in 1979. For the next five years, as the Hare Krishna Movement continued to expand, I kept polishing and expanding the manuscript. Clearly, the Hare Krishna explosion was not about to fizzle. 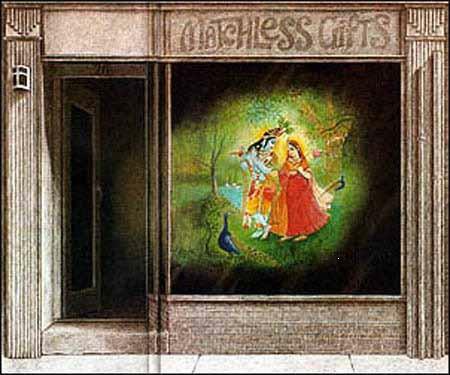 “Just as Krishna is always expanding,” Srila Prabhupada had said, “anything related to Krishna is also expanding.” In 1966, unknown to us, Prabhupada had truly launched a dynamic world religion. The question as to whether the writings of the acarya may or may not be revised by his disciples after his disappearance is answered by the rule of “arsa prayoga”. This principle states that one should not see mistakes in what the spiritual master has written or think that his writings may be changed to make them more effective or politically correct. To preserve his teachings in their originally published form is the way by which the acarya is honored, and to do otherwise is to dishonor him. That is the rule of “arsa prayoga”, a principle that devoted followers of a bona fide spiritual master must adhere to without deviation.